If you want to learn how to climb you can probably find a rock gym to get introduced to the sport. This isn’t how it’s always been though. “You could only climb when the weather was good and you could drive to New Hampshire,” said Kat Waterhouse, director of marketing for Rock Spot Climbing in Lincoln. Waterhouse explained how necessary it is to learn to climb outside with a seasoned climber or a hired guide. The pioneers of the sport needed years to build up enough experience to attempt famous climbs like the prow of Cathedral Ledge or VMC Direct on Cannon Cliff. 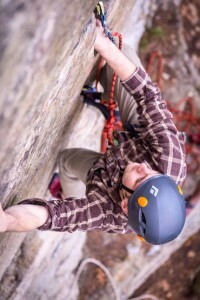 For many people their first introduction to outdoor climbing is either bouldering or top-roping. With the help of a spotter and one or more big cushions called crash pads, bouldering enthusiasts are protected from falls. “The bouldering scene in Rhode Island started in the ’70s with a bunch of Brown students,” said Kris Kearney, Manager of Rock Spot Climbing in Lincoln. Bouldering has become more popular over the last couple decades and recent years have seen a push in southern RI to develop access to bouldering in areas like Connors Farm in Smithfield. In top-roping, top-ropes are set up by an experienced climber and are strung through an anchor above a climb. A climber ties into one end of the rope and a belayer clips into the other end. Belaying consists of managing the slack in a rope system to keep the climber safe; the belayer literally holds a climber’s life in their hands. As the climber ascends the route, the belayer removes slack by pulling excess rope through a friction device like an ATC or a GriGri. When a climber falls, the belayer holds the brake end of the rope to keep it from sliding through their belay device. Because either person is effectively on opposite sides of a pulley system, the belayer isn’t catching the entire weight of the climber. In lead climbing, the rope is piled at the bottom of the cliff and as the climber progresses up the wall, the belayer lets slack out. The climber either sets their own protection into the rock or clips into bolts drilled into the wall. The downside to this kind of climbing is that leader falls are much longer — twice the distance from the last piece of protection they clipped into. In gym climbing, you can practice everything from strength conditioning to bouldering, top-roping and lead climbing. “Kids can come in and have an after school class, and become really strong indoors,” Waterhouse said.